Space-based solar power could become the most powerful energy source. While the idea of a solar energy station in space is not a new concept, unlike the past, when it was more of a concept that only seemed possible in a science fiction novel, today, the idea of building a solar power station in space, that could harvest non-stop continual power, is becoming an idea that scientists may actually be able to make possible, CNN reported. No clouds or night exists in space to inhibit sunlight. Space is absent of an atmosphere and, therefore, there are no clouds to block the sun. Likewise, scientists explained that in geosynchronous orbits, night does not exist. 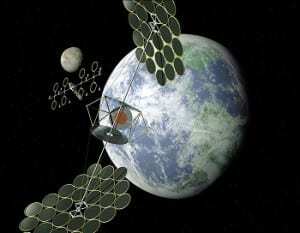 Thus, these problems that effect conventional solar power generation methods on Earth, are not an issue in space, where power from the sun can be harvested without interruption 24 hours a day, 365 days of the year. The U.S., Japan, China and India have projects in the works that could eventually lead to the development of robots that would assemble solar arrays and may one day provide the Earth with enormous amounts of renewable and clean energy. This energy would be delivered wirelessly via methods, such as microwaves or laser beams. In fact, some variations of this space-based solar technology idea could result in up to 1 gigawatt (GW) of energy sent to Earth, which would be enough power for a large city. Physics isn’t the roadblock for this solar energy concept but economics remains an issue. The trouble with cost is that in order to construct the power-transmitting satellite that would be required, numerous space launches would be necessary. Considering some space launches can cost up to $40,000 per kilogram, it could cost as much as $20 billion to complete the first space solar energy station. Thus, although possible, major funding would be needed to carry out such an enterprise.